« Guest Blogger Silver James! It’s time to announce the winner of a copy of FAERIE FATE from Silver’s guest blog! Congratulations, Kami! Please email Silver at silverjames@swbell.net with your choice of paperback or ebook, and be sure to include your snail mail address for the book, or email address for the .pdf version. And for everyone else, here’s my question of the day: Have you bought or gotten an e-reader yet? This entry was posted on Thursday, April 15th, 2010 at 1:00 am in Guest Bloggers. You can feed this entry. Both comments and pings are currently closed. Congrats, Kami! 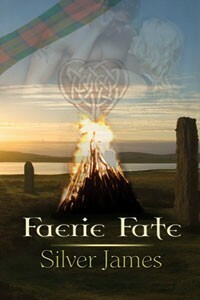 I know you’ll love FAERIE FATE. I have an e-reader and right now I use it mostly as a virtual bookcase. I still need to hold a book and turn pages. Besides you can’t walk down the aisle of an ereader and browse and pick up books and fan them out. I don’t have an e-reader. I need a physical book to hold, too. I like the smell and the feel and the sound of the crisp pages as they turn. :happy sigh: Not that there isn’t value in an e-book. My friend – who never has time to read a whole book anymore – got a Sony for x-mas and she loves that she can read anywhere now. I’m just not ready yet. I also don’t have an e-reader. And the thought of one has no appeal. I’m with the other witches, I need that book in my hand. Plus I am attached to my “library”, I don’t keep all the books I read but I have a pretty substantial collection. Daughter and I have a plan to pass our books, along with my mom’s, down through the generations. We want actual libraries in our houses with the floor to ceiling bookcases like they had in the past. I am also thinking of the headaches I get when I read stuff on my computer, I wonder if the e-reader would be similiar. One nice thing about them would probably be not having to wait so long for e-books to come out in print, and then there are the ones that never seem to make it to print. However, I would just buy the print version when it came out anyway so the cost just doesn’t seem worth it to me. I have the kindle app on my phone but I haven’t read an entire book on it yet. I work on a computer all day long so I have no desire to sit at it to read but maybe later on. I enjoy holding a book and I read a lot in the bathtub and I’d be paranoid taking an ereader in there. I have an ereader. Actually Hubs bought it for me…. yea.. awwww… well.. nooo.. Right now it is frozen! We are not sure what the hell happened to it. So Hubs is working on it and trying to see if he can “fix” it. If not… I might be buying me another one in the near future. I have an older model Sony ereader. Butttttttt, I do love a book in my hand and the pages beneath my nose.. lol! The ereader I like because for those ebooks ~ sometimes reading them on my computer hurts my eyes…. Anyways… have a great day witches!!!! G’morning, witches. Congrats, Kami. Email me! I was one of those who swore *they* would tear the paper versions of books from my cold, dead fingers. Then I received a Kindle for Christmas. OMGOMGOMG! I have arthritis in one hand and bad wrists from typing all day. I couldn’t believe how much easier the Kindle was to hold! When I packed for my two-week vacation (11 of those days on a ship with limited luggage), I downloaded FIFTEEN books to Kin. 15, XV. Try packing that many and lugging them! And I read most of them on the trip. I really believed I wouldn’t like the ereader. I was wrong! Is it time for appletinis yet? Keeping the library under control is one real advantage of an e-reader. I’m eventually going to get one, I’m just not ready yet. Dru, that’s one drawback for me too–I like browsing the bookstores! B.E., e-reader sounds perfect for your friend! I do like the feel of books, but I suspect I wouldn’t notice after a while. I’m more worried about losing the ereader in an airport or something. Losing an 8.00 book is just annoying, but losing a 200 to 400 hundred dollar device would seriously tick me off. Val, ohhhh I’m envious of your library and bookshelves! I never hang on to my books. I grew up passing books around and still do it. The books I have on my bookcase are mostly research and a strange collection of fiction that just ended up there somehow. Amanda, I would have a hard time reading a lot on my phone too. From what I’ve seen actual e-readers are a bit easier. Sometimes by the end of my day, I can’t read at all. My eyes are just too tired from the computer. Years ago with the early e-readers, someone told me she sealed hers up in a clear ziplock back and read in the bathtub with it that way. I don’t know if I’d risk my device that way though! Cecile, so it’s easier to read books on the actual e-reader than the computer? Silver, man you are so talking me into it! Like you, I sometimes have trouble with holding books too. I figured and e-reader would be easier. Awww thanks on auto-buying the Wing Slayer Hunters! We won’t even get into the raging debate about having to buy the same book twice to get it in different formats. Who cares what time it is, let’s pour appletinis! Hooray, Kami! Thanks again, Jen and Silver! Okay Silver… Yes, it is appletini time… Tax Season as far as I am concerned it OVER!!!!!!!!!!!!!!!!!!!!!!!!!!!!!!!!!!!!!!!!!!! Yea, Jen sometimes with the back white light of the computer and reading for hours.. my eyes literally hurt. But I also stare at a computer all day long at work. The colors off set the eye distraction sometimes, but the white hurt sometimes. So, yea the ereader comes in handy. And it fits in my purse.. vs the laptop, lol. Okay, I am heading off with appletinis in one hand and Axel in the other… we are going make some noise in the Lair! Fedora, I have the same fear, so I totally get it! Cecile, good to know! About the e-reader not Axel and the Liar, LOL!